Facebook advertising. The source of much angst and many questions. The facts are this. Facebook ads are the most powerful marketing tool at your disposal. Without ads on average only 1 to 3% of your audience will see your Facebook posts. If you’ve got 10,000 followers then that might be acceptable, but if you’re just starting out only have a couple of hundred page likes, that means every time you post at best only nine of those people are going to see your post. I know that’s massive resistance out there to paying to reach your followers. It used to be free for pete’s sake! But Facebook is a business too, with shareholders to satisfy just like your local newspaper, or a glossy magazine. They wouldn’t promote your business for free, so why should Facebook? If you want to stay invisible on Facebook by all means keep pretending that the days of high organic reach are still with us, and keep doing what you’ve always been doing. For businesses Facebook has to be viewed at as a low cost advertising platform. The days of high organic reach are over, unless you already have a very engaged following. If you’re just starting out the only surefire way to grow your Facebook audience is by regularly sharing valuable, useful content and by paying to play. This is particularly true for your promotional content because otherwise Facebook will keep it off news feeds. That’s what their users prefer, so that’s what they get. If you want to harness the full power of Facebook and send your target audience to your website in their droves, boost sign-ups and make sales. Then read on. It’s cheaper than traditional advertising and you are in full control. I just ran an ad for a client over two weeks that cost her £0.21 per click for 330 clicks. If that doesn’t sound like many remember that’s not clicks from random passers by – it’s 330 clicks from a specific target audience – her ideal customers. We spent just under £70 in total over two weeks. Peanuts. And that’s just our first ad. Next time, I know we can do even better. That’s the thing with Facebook ads, you can use the data from each ad you create to learn what works and what doesn’t, for your audience. What’s more you can experiment with different visuals, wording and content, tweak ads as you go or stop them all together. No more signing off ads and hoping for the best with no way to really measure how well it’s doing or pull something you spot an error in. You’re in full control and you can see and measure the impact your ads are having straight away. I luuuuuuuurve Facebook ads. They are a marketers dream. So in the name of trying to break down any resistance you might have to taking the leap into trying out your first Facebook ad I’ve put together this short list of expert advice about Facebook advertising that has helped me demystify the world of ad accounts, ad manager, power editor and pixels. Expert tip: unless you’re managing a high volume of ads for an agency or are already a bit of an old hand at Facebook advertising stick with the standard ad manager platform and ignore power editor. It’s far simpler. What Amy Porterfield doesn’t know about Facebook isn’t worth knowing. She’s my guru for all things online marketing, but Facebook is how she made her name. In this beginner’s guide to Facebook ads for Social Media Examiner, she runs through the basics of getting started with targeting, because targeting the wrong people is where most people go wrong with Facebook ads. What I love about Amy is that she keeps things simple – one of her mottos is ‘Pursue simple, get fancy later’ – and she’s an excellent teacher. If this leaves you wanting more, this podcast on Amy’s own site goes into targeting in a bit more depth, and you can also download her targeting starter guide from this page. Ever wondered how Facebook decides what ads your interested in seeing? Alex demystifies how Facebook segments audiences to help you better understand how to get ads to work for you. He also explains how to use your own valuable content that you’ve designed to appeal to your ideal customer, to filter those audiences even further so that you target the right people, get them to click on your ads and capture their details so that you can convert them into customers later. This article is full of invaluable tips! Kane Jamison runs through the ten biggest quirks of Facebook advertising that caught him off guard, so that you can avoid making the same mistakes, from the 20% text rule that applies to images, to the four different ways to access ads. The advice here is stellar and will help any ad novice navigate the tricky waters of creating your first ad. Seriously, the advice in from these experts is priceless. Facebook advertising is the most powerful tool at your disposal as a business owner and make no mistake, if you get it right you absolutely will make more impact and get more customers. 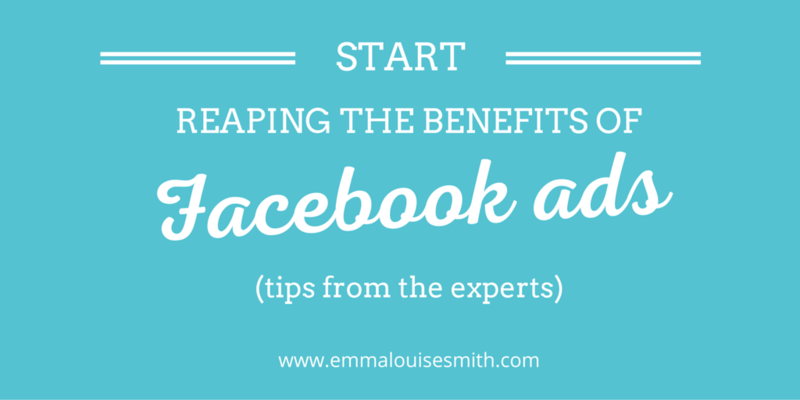 So tell me, what’s stopping you from using Facebook advertising? Let me know in the comments. Here’s to becoming an advertising ninja!